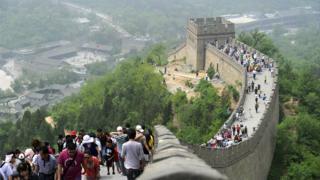 Heritage officials have launched a crowdfunding campaign to pay for restoration work on the Great Wall of China. More than 16,000 people have donated online since the campaign started at the end of August, raising almost 300,000 yuan ($45,000; £34,000) so far. It's being run by the China Foundation for Cultural Heritage Conservation, a state-supervised body, which says the wall is in serious need of repair, China Radio International reports. Work on the wall began more than 2,000 years ago, but much of what visitors see today was constructed during the Ming Dynasty (1368-1644 AD). The foundation says that of more than 6,250km (3883 miles) built during that era, a third has disappeared. It's hoping to raise 11m yuan ($1.7m; £1.2m) by 1 December. Dong Yaohui, who's in charge of the fundraising effort, says protecting such a large site is more than the government can do alone. "By pooling the contribution of every single individual, however small it is, we will be able to form a great wall to protect the Great Wall," he says. The cash will go towards restoring the Xifengkou section, which runs through a reservoir, and according to Mr Dong all spending will be made public. Many Chinese social media users are sceptical about chipping in, though. Some are confused about why such an iconic site has to resort to public handouts. "They have plenty of money, why do they need to crowdfund?" asks one, while another wonders if the Great Wall's admission fee will be waived for donors. But there's some enthusiasm, with one person writing: "I am willing to invest in this! In the future I can proudly tell my grandchildren that this is our family estate!"